As you can see the page has three buttons at the top - Sign In, Sign Out, and Show Data. Clicking on the Sign In button calls the SecurityController API and grabs the JWT token returned by the service. Clicking on the Sign Out button removes the JWT token from the client side. And clicking on the Show Data button calls the Employee API. The data returned by the Employee API is shown in a table. Open the same project you developed last time. 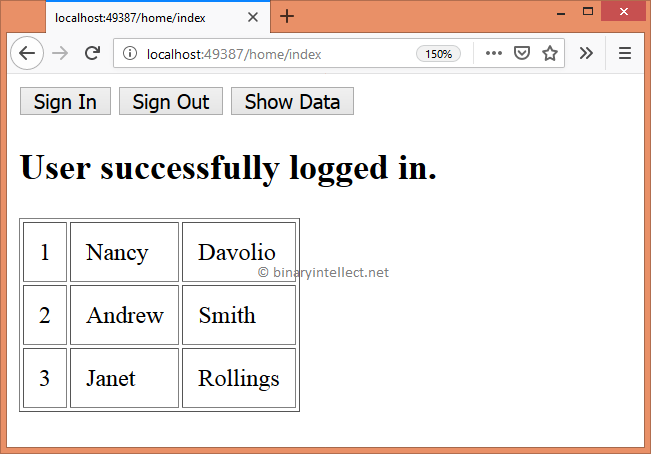 Then add HomeController and Index view to it as you normally do for any ASP.NET Core MVC project. Then add the following markup in the Index view. The three buttons mentioned earlier have IDs - login, logout, and showData. The response <div> shows the response from the API calls. The response could be success / error message or employee data. Then add a new <script> block and write the following skeleton code in it. The code consists of three event handler functions for dealing with the three buttons. Let's complete each handler one-by-one. The following code shows the Sign In button's click event handler. The success function receives the Ok response along with the JWT token. The important thing is this - we need to preserve the JWT token returned by the Security API somehow. There could be different ways to do that such as hidden form field, localStorage, or sessionStorage. Here, I am using sessionStorage so that the JWT token is not permanently stored on the client machine. As soon as the browser is closed the sessionStorage and hence the token gets destroyed. Finally, we use $.ajax() method to initiate the Ajax call to the Security API. Now let's discuss the Show Data functionality. The Show Data event handler makes a request to the Employee API using GET verb. What is important while making this call is to pass the JWT token issued earlier to the secured Employee API. To accomplish this task we use beforeSend function and add the Authorization HTTP header to the request. The success function receives the employee array of objects and renders it into a table as shown in the beginning of this article. The error function displays the error message in the response <div> element. The following figure shows a sample erroneous run of the page when you try to call Employee API without signing in.